Choosing a VA Disability Attorney Means Learning What Questions to Ask. While I appreciate the compliments, I shudder a little at emails like this. For 2 reasons. First, I get a lot of emails like this. And while I diligently represent my clients – I often tell them we will pursue their claim until we have no more appeals or until we win – I am most assuredly not the best. Second, I don’t want Veterans to choose their attorney based on who their friend thought was the best. I want Veterans to choose the VA Disability attorney who is BEST for their case. In some situations, that may be my law firm, Attig | Steel, PLLC. But it may also be any one of the dozens of other attorneys who have made the representation of Veterans their professional life’s work. There are hundreds of attorneys that are out there representing Veterans, and I’m here to tell you that who is best for your friend’s case may not be the best for your case. How do you Find the Best VA Disability Attorney for your Claim? First, you have to answer the question: do you NEED an attorney? Some of you don’t. Some of you have the ability to improve your claim on your own, and fix the problems that are in your claim without need of a professional to help. Some of you are the “do-it-yourself” type, and hiring an attorney will require you to cede control over your claim. #1: Subscribe to the Veterans Law Blog® and use the resources that appear on this blog – there are thousands of posts, chock full of information about VA claims and appeals for those of you that are the “do-it-yourself” type. Get a copy of your C-File, and see if you can figure out if the 5 most commons reasons that the VA is screwing up a VA claim applies in your situation. #2: Need help learning the VA Claims process? Take a look at the books and Videos that I have written to reveal the secrets of navigating the VA Claims Process. #4: Need help proving your claim, or finding 5 Star Evidence to give your VA Claim wings? I’ve written another e-book to help Veterans that need this kind of assistance. #5: Have a Sleep Apnea claim? 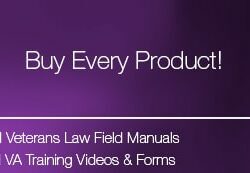 The Veterans Law Blog® is the only place you can get a comprehensive 165 page guide to improving your VA Sleep Apnea claim. 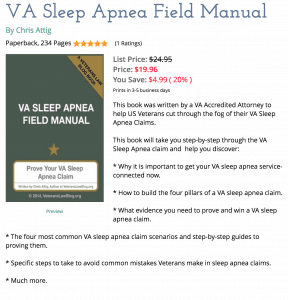 Learn how Veterans are using this book – every day – to get their VA Sleep Apnea claim granted without needing to hire an attorney. Once You Decide you Need a VA Disability Attorney, Here is How to Find the Best For YOUR Claim. The more C-Files I review for possible representation, the more I realize how important it is to choose the correct representative for your VA Claim. I see it all the time – a Veteran gets in over their head in their VA Benefits claim, and then starts scrambling to find an attorney. * What professional credentials to consider. * Why an attorney’s success rate is the LEAST important question a Veteran should ask. * How an attorney’s case volume and experience may affect you. * How to determine whether the attorney and firm is a good fit for you. I have written a FREE guidebook that will answer all of the above questions, and will teach you how to select the VA Disability Attorney that is best for your claim. It also includes 4 Tips on selecting a VA Disability Attorney and a 30-question checklist with some question ideas when you are interviewing attorneys. This isn’t going to be an eBook you save, read once, and forget about. This is something that you can come back to again and again as you try to choose the best VA Disability Attorney for your claim. Let me leave you with this thought about choosing a VA Disability Attorney. Veterans get out of the VA Claims process what they put into it. If you throw a few forms at the VA, and hope that you will get favorable results, you will probably get denied. If you throw “everything and the kitchen sink” at the VA, you will overwhelm and confuse a bureaucracy that is not set up to study and analyze claims to find the right and best way to help Veterans. Same things go for an attorney. If you pick the first one that comes along – or the one that your buddy liked – you stand a good chance of choosing an attorney that is not right for you. Take your time, research several attorneys; use my free guidebook to help you make a smart decision about what advocate is best for your claim. 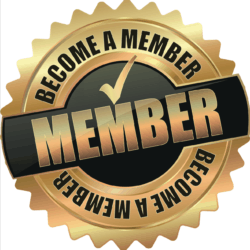 If you do, I am confident that you will have a better experience with an attorney, and who knows, you might just find that they change the way you experience the VA Claims Process, whether it is the new “modernized” process, or the old Legacy process.